When patients come into the office for breast reconstruction consultations, one thing that can happen is getting overwhelmed when learning about the different reconstruction options. It’s completely natural since there is a lot of information being exchanged and usually a lot of questions being generated. That is why we are always looking for ways to reduce potential stressors for our patients. Whether it is a post-consultation discussion with me about the emotional weight of their surgery and the options discussed with the doctor or a Pre-Operative Guided Imagery session to quell some of the anxiety, we want to make sure everyone is comfortable and feel empowered about their path going forward. When the decision is made to move forward with reconstruction surgery, we provide a “survival kit” of sorts that helps patients through every step of the recovery and post-operative process. The kit contains a fair amount of supplies, and the doctors and I have felt that there was a better way to distribute them...until now! 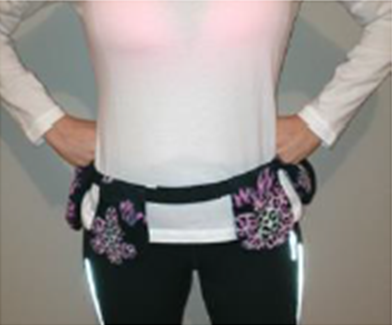 · A femPower belt with pouches to hold the post-operative drains – this unique accessory was created by one of our patients. I hope you all enjoy using the totes as much as it gave us the pleasure of creating them.